King George VI inspects Cadet Ratings on divisions at Lancing, May 29th 1941. Cadet Ratings march past the Quarterdeck on the South Road behind Hove Marina; these men were in the final stage of their training before being granted a commission. The outriders at the head of the Victory Parade through Hove pass the front of HMS King Alfred in May 1945. Officers and guests gather to watch the parade from the roof of Hove Marina. 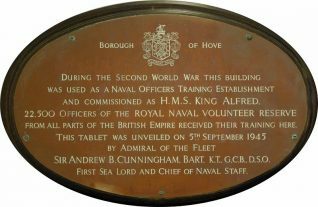 Plaque commemorating the war time ruse of the Hove Marina complex as the Royal Navy's Officer Training Establishment H.M.S. King Alfred. 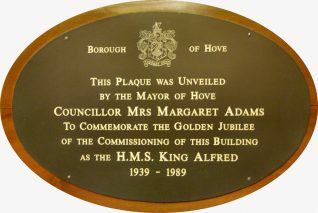 Plaque commemorating the Post War reopening of the Hove Marina complex as the King Alfred Leisure Centre. 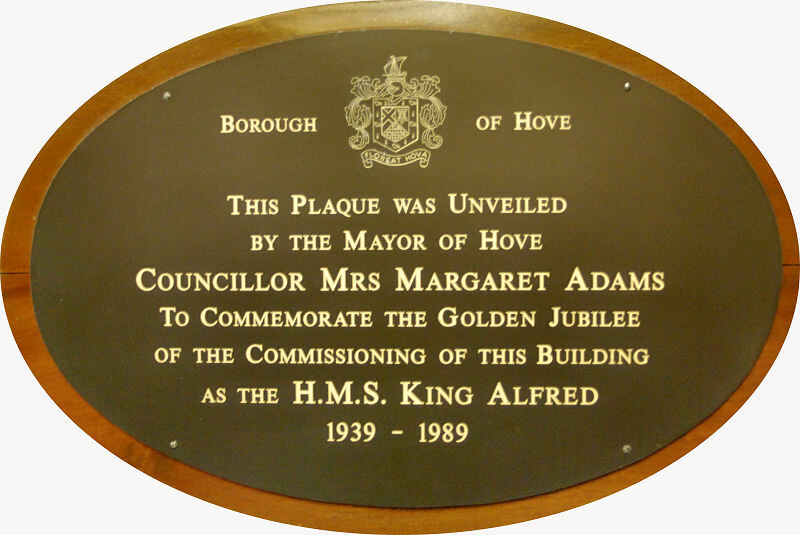 Plaque commemorating the Golden Jubilee of the commissioning of Hove Marina as the Royal Navy's Officer Training Establishment H.M.S. King Alfred in 1939. Replica of the Ship's Bell - this is on display in the King Alfred Leisure Centre. 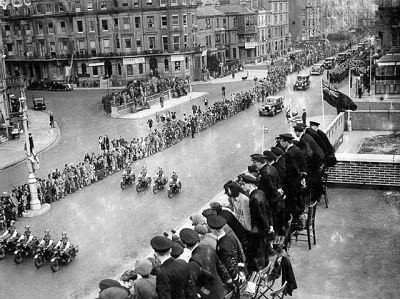 The personnel and trainees of King Alfred celebrated VE Day (Victory in Europe Day, May 5th 1945) in Hove and marched through the town in the Victory Parade; the WRNS led the naval contingent. By the end of this month a scaling down of operations at King Alfred was begun as the numbers of officers required for sea duty became greatly reduced. On the morning of June 6th 1945 Captain Pelly died suddenly aged 57 whilst on duty at HMS King Alfred (H); he was given a full military funeral service at the main building on Hove seafront attended by senior officers from the Army, Navy and Air Force establishments in the area. 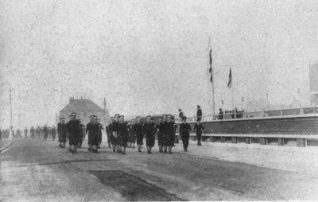 The coffin was carried on a gun carriage along the Kingsway to the former Hove Marina followed by the funeral procession made up of contingents from the WRNS, King Alfred staff and Cadet Ratings. After the service the coffin was taken to All Saints Church, Witham in Essex to be buried. Captain Cuthbert Coppinger DSC arrived on June 21st to assume command. He was to continue the scaling down of training at HMS King Alfred; numbers were further reduced after VJ Day (Victory over Japan Day, August 14th 1945). Mowden School was the first annex to close, training ceased there in October when the last Division left for Lancing. When this Division left Lancing for Hove in December, training ceased and clean up operations began in preparations for its return to civilian control. The final handing out of commissions at King Alfred took place in late December 1945. Over the six years of war, HMS King Alfred trained a total of 22,508 RNVR officers for active sea service, these were men from a variety of commonwealth and allied nations including Australia, Belgium, Canada, China, Holland, New Zealand, Norway, South Africa, and the United States. 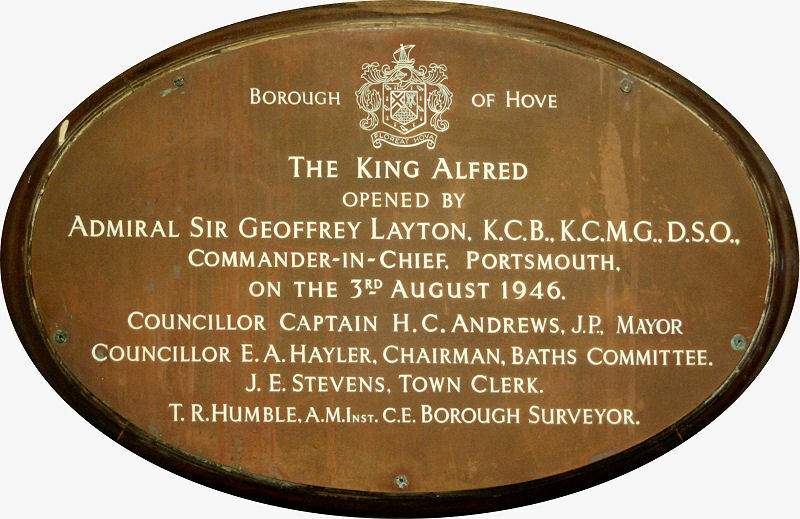 On January 7th 1946 HMS King Alfred moved to Exburv House near Southampton; the site at Hove Marina was known as HMS King Alfred II during its clean up and demilitarisation period, finally closing in June 1946. ‘During the Second World War this building was used as a Naval Officers’ Training Establishment and commissioned as HMS King Alfred. 22,500 Officers of the Royal Naval Volunteer Reserve from all parts of the British Empire received their training here. The plaque, and two others which commemorate the reopening of the centre and the Golden Jubilee of the commissioning of Hove Marina as the Royal Navy’s Officer Training Establishment H.M.S. King Alfred in 1939, have since been removed when the building underwent remodelling, they are currently not on public display. HMS King Alfred finally closed in August 1946 when Exbury House was renamed HMS Hawke. The name King Alfred was reused in 1994 when a new Royal Naval Reserve training centre opened at Whale Island in Portsmouth designed to take over the training roles of Brighton and Hove’s last commissioned naval establishment, HMS Sussex, and Southampton’s HMS Wessex which were both closed in 1994. The name King Alfred was also adopted by the Hove & Aldur Sea Cadet unit which became the T.S. (Training Ship) King Alfred. This unit has enjoyed a long association with the Royal Navy in Hove, sharing accommodation with the Sussex Division RNVR/RNR from 1946. ‘The King Alfred Papers’: a collection of letters and research material held at the Hove branch of Brighton & Hove City Libraries. ‘The Wave’: King Alfred’s internal magazine; complete bound set held at the Hove branch of Brighton & Hove City Libraries. My time in King Alfred was 1944. The Normandy invasion had taken place. The run-down had started. Thirteen of us were discharged in November. I re-enlisted in the Indian Army and served as a Gurkha officer in NWFP (now in Pakistan) until independence. My book “The Signaller Wren” is published by AH Stockwell ISBN number 978-0-7223-3969-5 priced at £10.99 obtainable through Amazon, Nielson, Waterstone or Blackwells or in shops. My mother worked in the bar of HMS King Alfred as her war service for the whole period. She had many stories -no time to get to the air raid shelter during a bombing raid so she got under the billiard table where she was protected on all sides by the junior officers! She was in the bar when the news of the loss of the Prince of Wales and the Repulse came in over the radio. Many of them knew the crew and could not believe the loss of two of the finest ships in the fleet. About 1954 I remember swimming off the K A building as a small child when everyone started running this way and that, mothers desperately seeking their children etc. I looked up and saw a huge black mine very close to the shore coming close to the beach. My older brother had not seen it and he was in the sea and could not hear the noise. She did get him in however. To the west of the K A at that time was a RNVR training hut. Two brave lads got into a boat with rifles and took it out to sea. They fired at it and detonated it but were too close as they were so low in the water that they could not fire from a safe distance. Both were killed. My parents said there were about 40 mine crises on the end of the Palace Pier and 30 on the West Pier. I was schooled at Hove College, close to the King Alfred, and joined the Sea Cadets at King Alfred from the late ’50s to early ’60s. I then joined the Merchant Navy in ’62 where I spent all my working life. On one of my first trips back up the Channel from deep sea, before traffic lanes forced us to route off the French coast, I remember the RNVR practice signalling us with morse after dark with their large searchlight. 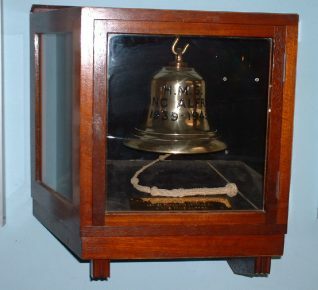 It was then standard practice to call a ship and ask her name and where bound. This information was then usually passed to Lloyds of London. We had a great time there, with our boats kept at Aldrington Basin and the opportunity for occasional trips on the coastal minesweeper also based there – H.M.S. Curzon, I think, like the local cinema. Incidentally, I used, and still have, a sextant such as the one in your photo, and the trainee is indeed looking to bring the sun down to the horizon to determine its altitude and hence the ship’s noon latitude, but that sextant can also be used with stars and planets at twilight for a much more accurate fix of her position.